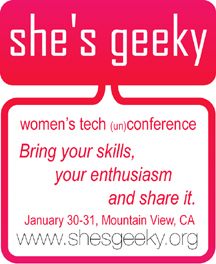 Hey.. She's Geeky is a few days away, and you can still sign up. Really looking forward to interacting with all those awesome girl geeks on Friday and Saturday at the Computer History Museum in Mountain View! The second She's Geeky will happen at the end of this month! The first was held 14 months ago in Mountain View at the Computer History Museum, and this year it will happen there again. PLEASE be sure to register for one day $59 or two days $108 and get the early bird price. Let's face it, this conference is just covering costs with those prices... if you are only able to come on a weekday, you'll be able to come Friday, and if weekends are all you can do, Saturday is it, or even better, come both days!